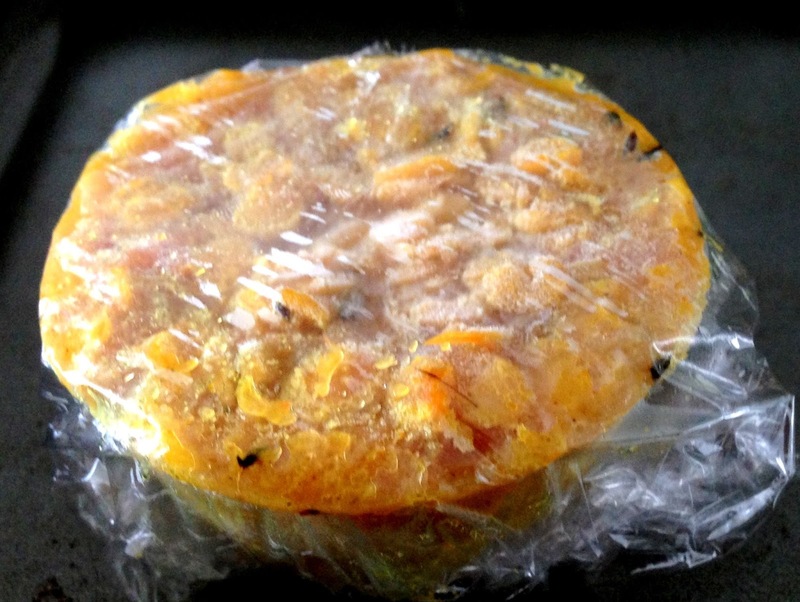 When giving a food gift for a new parent, it's nice to give something frozen that can be easily reheated to make a nutritious and tasty meal in minutes - life with a baby gets unpredictable and busy, after all. And even if you're making dal just for yourself, you know you want to have something home cooked and cozy in the freezer for a chilly fall evening (and we've definitely got those coming up soon) - so whip up a big batch and get thee a'freezin'! When making the Yellow Dal, I knew that I wanted to give it to ActressA frozen and paired with some store-bought pre-cooked rice so that she could have a complete meal on hand when needed. But then, just like with freezing ginger, I started thinking about the fact that if you have a whole container full of dal, you're probably not going to want to have to defrost the entire thing just to take out two servings at a time. Who has the time for that?! The whole idea is to have something quick at hand. 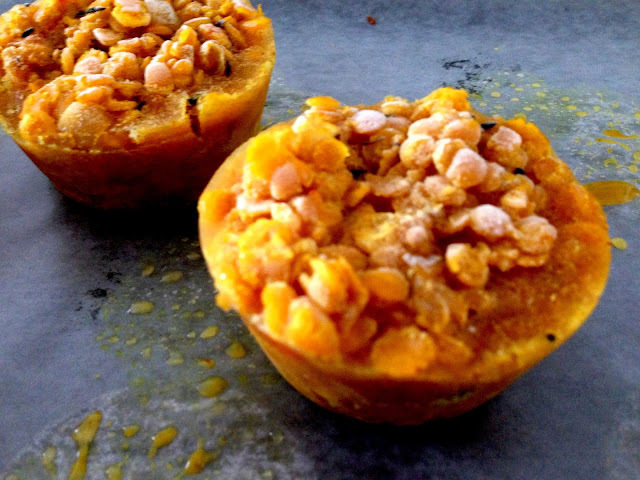 So, keeping the same concept in mind, along with this helpful post from The Kitchn, I decided to freeze little portions of the dal in a muffin tin. 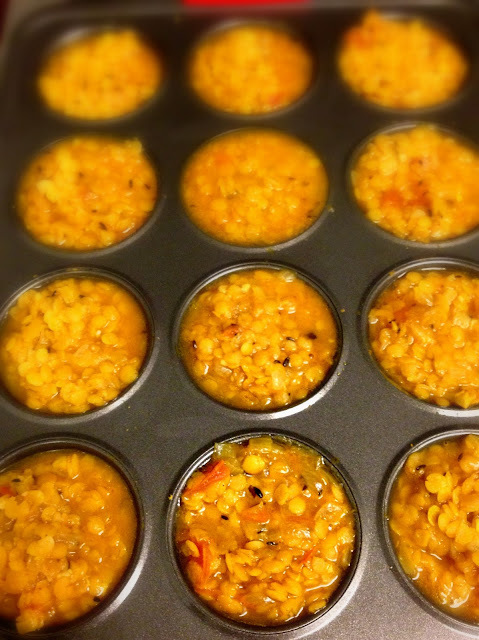 After you make the dal, allow it to cool, and then ladle it into the muffin tins up to the top. 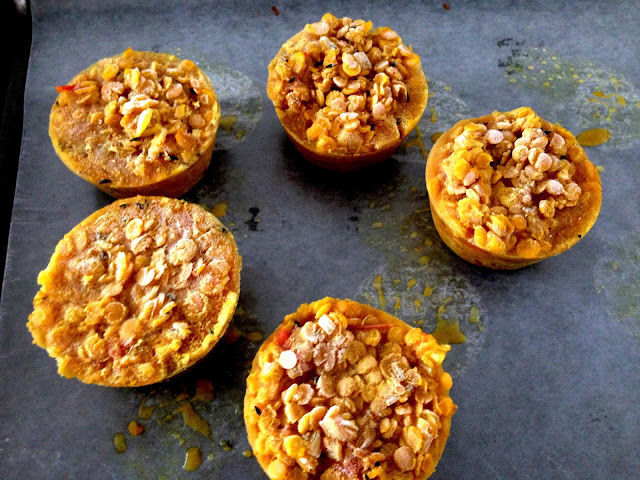 Place the full muffin tin in the freezer and allow the dal to freeze overnight. Don't freeze for a lot longer than 8 hours, because the dal might then develop freezer burn, and that's no good. When frozen, the dal "muffins" should easily pop out with the help of a butter knife to lift an edge. If they don't, fill a cookie sheet with hot water and place the muffin tin in it. After a minute or so, you should be able to pry out the frozen dal using a butter knife. 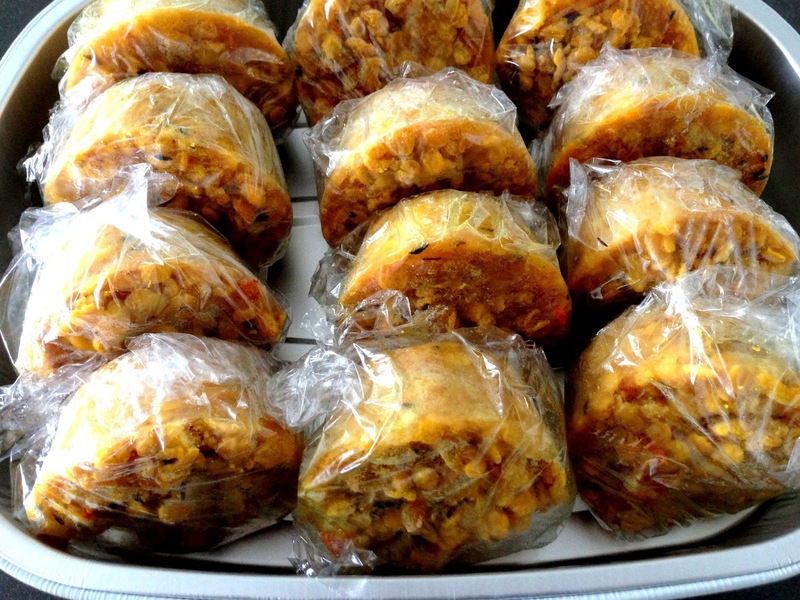 Wrap each muffin-sized serving individually in plastic wrap, then pop them into a freezer bag and into the freezer again waiting patiently for the day you decide you want split pea goodness! The standard muffin tin will hold about 1/3 cup, so two frozen dal "muffins"served hot over rice would be good for one person. If you're making a care package like I was, a disposable casserole dish with a lid makes a handy container for the little frozen dal "muffins" - easy to leave in the freezer right until the moment you step out of the door! When you're ready for some dal, just take two of these per person, heat them up, and serve over rice! This is probably the BEST post Ive read this year. Thankyou! !